That Guardian subhead of "President Maduro’s cancellation of conductor Gustavo Dudamel’s tour is a clear bid to weaponise the country’s greatest export, its musical education programme" is an unfortunate choice of words. 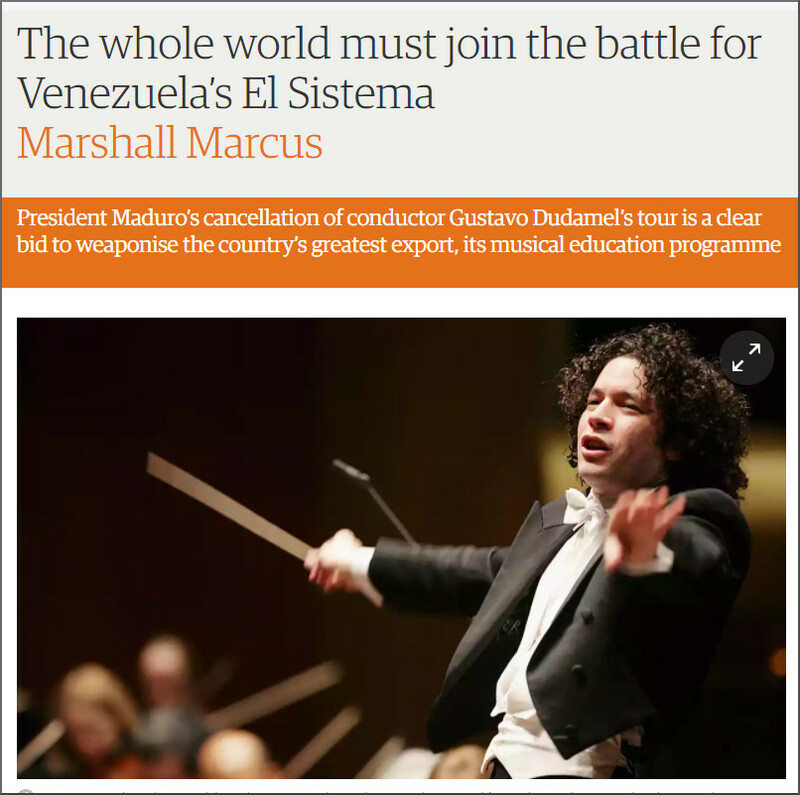 The article, which pleads for the whole world to support Gustavo Dudamel and which condemns a bid to weaponise music education, is written by Marshall Marcus who is CEO of the European Union Youth Orchestra. The European Union Youth Orchestra (EUYO) has a three year corporate partnership with United Technologies Corporation (UTC), a partnership publicly endorsed by Marshall Marcus. UTC is a large military contractor and earns about 10% of its revenue from the U.S. government. It is one of the largest defense industry political donors. The Center for Responsive Politics, the premier research group tracking money in U.S. politics, reports that in 2016 UTC donated $1.2 million to federal candidates of which 64% went to Republicans. Possibly as a result UTC has quite some influence. In June 2017 CNBC reported UTC CEO Greg Hayes as saying that "President Donald Trump stands out from his predecessors because he listens to the company...[The White House] will actually listen and take our advice and take our input and that's something we haven't seen in a while". Pratt & Whitney is part of UTC and over 6,500 Pratt & Whitney military engines are in service with 34 armed forces worldwide. UTC Aerospace Systems supplies SWIR enhanced vision systems. Among potential applications for the SWIR system according to a UTC press release is the General Atomics MQ-9 Reaper. This is an unmanned aerial surveillance and attack vehicle - aka drone - developed by General Atomics primarily for the United States Air Force. All this industriousness comes at a cost, and in 2008 researchers at the University of Massachusetts Amherst identified UTC as the 38th-largest corporate producer of air pollution in the U.S.. It is incontestable that we we need more music education, and it is incontestable that we need our youth orchestras. There is also no doubt that the Orquesta Sinfónica Simón Bolívar de Venezuela and European Union Youth Orchestra do priceless work. It is also an unfortunate fact that as public funding shrinks, partnerships with corporate entities - ethically challenged or otherwise - are inevitable. But given the current fashion for mixing music and politics, more transparency is needed: the EUYO website describes UTC as "among the world’s most respected and innovative companies". Even in the current funding drought classical music needs to beware of becoming an unction for ethical makeovers. Classical music also needs to realise - as Gustavo Dudamel is now realising - that when you swim in murky water you sometimes get attacked by sharks. And Guardian sub-editors need to choose their words more carefully when dashing out headlines written to please neoliberal readers. UTC is only one of many "Merchants of Death" companies or conglomerates that use classical music to gain new contracts, thus killing more people and increasing hunger and other forms of human suffering in the world. Sadly, people in Music Management have always, diplomatically and egoistically, decided to ignore this aspect of music life. Many international orchestras travel the world on political/diplomatic missions, even if the players in the orchestra are unaware of how they are been used. Multi-million arms deals are concocted and signed at International Music Festivals, Salzburg or Bayreuth to give just two names. I wish a Peace lover music journalist would dedicate himself/herself to study the Music-War connection.